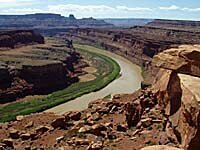 This trip to Canyonlands National Park was supposed to last two days, with one day of biking and one of hiking. I left home for Utah at about 5:30 a.m. and got to the park by 9:30. 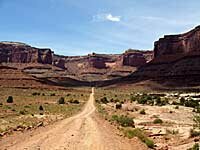 By about 11:00 I had ridden my mountain bike down Shafer Trail Road and hiked out to the Gooseneck Overlook along the White Rim Road. I set up my tripod to shoot a 360° panorama photo and enjoyed the view of the Colorado River and La Sal Mountains. My plan had been to turn back and head toward the car by 1:00, not knowing how long it would take to climb the hill of about 1000 feet vertical, out of the canyon. I hung out at the overlook for awhile until about noon; had lunch and decided since there was still lots of time, I’d ride a few more miles further down the road. It's a 100 mile dirt road and I knew I could only cover so much of it in a single day but I wanted to see more. I got to a spot called the Colorado River Overlook where I encountered three teenagers and their dad, all on bikes and thought to myself how easily the serenity can be broken. Until then, I had been enjoying the nearly total silence and isolation; basically having the time of my life. These kids were pretty loud, but just having fun, as was I. I quickly put a little distance between them and myself. 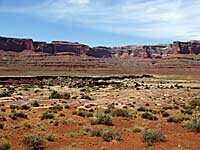 A little further down the road, three or four hundred yards, I could see where a pickup had stopped at the end of one of the canyons and decided that would be where I would turn around. As I coasted down the road enjoying the view, something unimaginable happened and I quickly flew over the handle bar of the bike and skidded on my face down the dirt road, landing, apparently on my left arm as well as my face. My immediate thought as I was sliding on my face was that I was probably going to need dental work since I was getting dirt in my mouth. As I came to rest, I sat up, crossed my legs and assessed the damage while blood dripped from my face onto the road between my legs. Feeling my teeth with my tongue while I spit out dirt, it was apparent I hadn’t broken my teeth but since I was bleeding, I must have a nose bleed or cuts on my face. Within a minute or two, the bleeding had stopped and I decided I was able to stand up. Upon standing up, I found my hat, and my sunglasses broken in half, laying on the road. The sunglasses explained the pain on my nose between my eyes. My chin was also hurting a bit and I touched it to feel a cut or abrasion there. Then it occurred to me that I hadn’t been wearing my helmet and checked my head to see if there was blood in my hair, which there was not. “Whew,” I thought as I unstrapped the helmet from my bike and put it back on. About four or five minutes after the crash, along came a stranger in a pickup who saw the blood on me and the bike on the ground and stopped to see how I was. He offered to radio for help. I asked to use his truck mirror to look at my chin and when I saw my face, decided it was time to go home. I told him I thought I was all right and could ride. He wished me luck and drove away. By then my left hand had started hurting and when picking up the bike, I discovered it would be pretty hard to grip the handle. The chain had come off the front sprocket, so I got my other hand greasy putting it back on and started to ride back up the slight hill. I was about eight or nine miles from the car. I figured it might be a long afternoon but I had plenty of food and water so was not worried. I could grip the left handle with my thumb and forefinger but couldn’t use the brake lever. It was mostly uphill to get back and it was the front brake I couldn’t use so that was no real problem; still, I took it slow. It took roughly two and a half hours to get back to the car. I passed several groups of people and vehicles but all were going the other direction so none offered a ride. I don’t think I would have accepted a ride, even if they had. I knew I could get myself out of this. Several people offered water and some just stared at me. I looked pretty bad, with blood all over my face, arm, knees, and shirt and lots of dirt rubbed into my shirt and shorts. I wish I had asked one of those folks to take my picture, but I had already taken a close-up with the self-portrait method. I made lots of stops to rest and while it was hard to get to my camera with my hand hurting, took several more photos. After a short while riding I was pretty convinced I had broken my hand and was trying to decide where I should go for treatment when I got to the car. I was pretty sure I would need to get my chin stitched up, regardless of the condition of my hand. As I pushed the bike up the last steep mile, all I could think about was how I was going to be able to do my job if my hand was broken. When I got to the car, it was difficult getting the bike inside with the injured hand but I got that done and went about checking on my face. With a wet paper towel, I cleaned my chin well enough to see the big cut and decided stitches were in order, somewhere on the way home. Moab would have been out of my way, so I first headed toward the gas station (campground) on Highway 191 to see if I could figure out where the hospital might be in Grand Junction. I kind of freaked out the customers and staff at the gas station with my appearance but luckily, they had a Grand Junction phone book so I called the hospital and got directions. In about two hours; 5:30 or so I was at the hospital and they had me stitched and x-rayed in about two more hours. I was treated very well at the hospital. That was the best experience of the whole disaster. 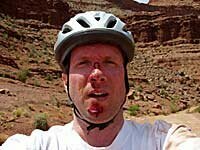 Bicycling the White Rim Road is not dangerous, if you're careful and paying attention. My accident was the unfortunate result of taking my eyes off the road at the wrong time. I will go back someday; not sure if it will be on a bike, but maybe.